Using concentrated solar energy for power, a research team from Sandia National Laboratories is building a prototype device intended to chemically “reenergize” carbon dioxide into carbon monoxide using concentrated solar power. Carbon monoxide could then be used to serve as a building block to synthesize a liquid combustible fuel, such as methanol or even gasoline, diesel and jet fuel. The prototype device called the Counter Rotating Ring Receiver Reactor Recuperator (CR5) is designed to break one of the carbon-oxygen bonds in the carbon dioxide molecule to form a carbon monoxide molecule and oxygen in two distinct steps. It’s a major piece of an approach to converting carbon dioxide into fuel from sunlight. 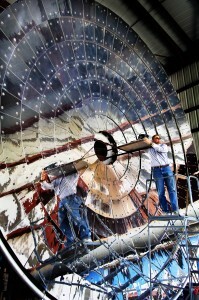 Sandia's Solar Furnace. Click image for more info. The Sandia research team is calling this approach “Sunshine to Petrol” (S2P). “Liquid Solar Fuel” is the end product and may be methanol, gasoline, or other liquid fuel made from water and the carbon monoxide produced using solar energy. Rich Diver is the inventor, and explains the original idea for the device was to break down water into hydrogen and oxygen. The hydrogen could then fuel a potential hydrogen economy. Then Sandia researchers came up with the idea to use the CR5 to break down carbon dioxide, just as it would water. Over the past year they have shown proof of concept and are completing a prototype device that will use concentrated solar energy to reenergize carbon dioxide or water, the products of combustion. This will form carbon monoxide, hydrogen, and oxygen, which ultimately could be used to synthesize liquid fuels in an integrated S2P system. Sandia’s Project Champion is Ellen B. Stechel, manager of Sandia’s Fuels and Energy Transitions Department. Co-researchers on the project are Jim E. Miller and Nathan Siegel. Stechel explains that researchers have known for a long time that theoretically it might be possible to recycle carbon dioxide, but many thought it could not be made practical, either technically or economically. Stechel says, “Hence, it has not been pursued with much vigor. Not only did we think it was possible, the team has developed a prototype that they fully anticipate will successfully break down carbon dioxide in a clever and viable two-step process.” She even notes that one driver for the invention is the need to reduce greenhouse gases. Stechel’s prognosis is, “This invention, though probably a good 15 to 20 years away from being on the market, holds a real promise of being able to reduce carbon dioxide emissions while preserving options to keep using fuels we know and love. Recycling carbon dioxide into fuels provides an attractive alternative to burying it.” She might want to get going in the meantime to discover some capital and operating cost expectations. Diver says, “What’s exciting about this invention is that it will result in fossil fuels being used at least twice, meaning less carbon dioxide being put into the atmosphere and a reduction of the rate that fossil fuels are pulled out of the ground.” Now that’s a man catching on. As an example, he says, coal would be burned at a clean coal power plant. The carbon dioxide from the burning of the coal would be captured and reduced to carbon monoxide in the CR5. The carbon monoxide would then be the starting point of making gasoline, jet fuel, methanol, or almost any type of liquid fuel. Is that a clue that more opportunity exists in their concept? Diver says the prototype should be completed by early next year. 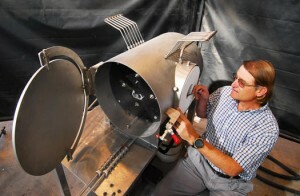 He hand-built the precision device in a shop at Sandia’s National Solar Thermal Test Facility and is now waiting on a few parts to finalize it. Initial tests will break down water into hydrogen and oxygen. That will be followed by tests that similarly break down carbon dioxide to carbon monoxide and oxygen. Besides having a nearly completed prototype, the research team has already proven that the chemistry works repeatedly through multiple cycles without losing performance and on a short enough cycle time for a practical device. “We just now have to do it all in one continuous working device,” Siegel says. One way or another, humanity is going to a carbon hydrogen cycle using sunlight, creativity, engineering and the water and carbon in the air to provide some liquid fuel. That will take some pressure off of fossil fuels that as they are used up will get increasingly expensive. One day, unless electricity generation and storage gets cheap and long-lived, short cycle carbon and hydrogen fuel systems will have a major impact on our economy. Thanks so much for sharing all of the great content! Looking forward to reading more posts.